One of the earliest published thematic maps. 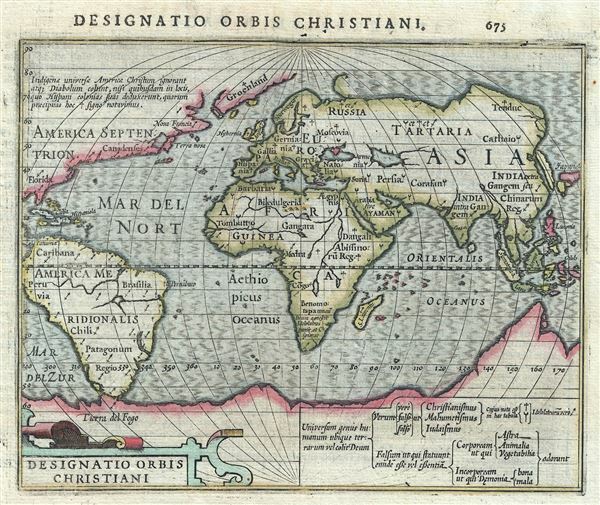 One of the earliest known thematic maps, this is a fine example of the 1607 Mercator- Hondius map of the World showing different religions. The world is presented on a hemispherical projection with Europe and Africa at center. Various symbols are sued to identify different religious groups including Christians (cross), Muslims (crescent), and idolaters (arrow). These reference a table in the lower right quadrant that provides references and additional detail. Cartographically this map follows the model associated with the ephemeral period between the navigations of Magellan and Drake, when it was believed that Tierra del Fuego was in fact attached to a massive Southern Continent. Drake's voyages of 1577 to 1580 proved definitively that this was not the case, but some European cartographers were slow to update their maps - the present offering being one such example. Other elements of cartographic interested include a misaligned Caspian Sea, an insular presentation of Korea, and a limited portrait of southern Java. Hondius prepared this as one of two world maps presented in the 1607 Latin first edition of the Atlas Minor, one of the better small format atlases to appear in the early 17th century. Plates for this were later sold to London booksellers who used them to illustrate some editions of Purchas His Pilgrimage. Mercator, G.,Atlas Minor (Amsterdam), 1607. Latin edition. Very good. Original platemark visible. Text on verso. Shirley, Rodney W., The Mapping of the World: Early Printed World Maps 1472-1700, no. 260.